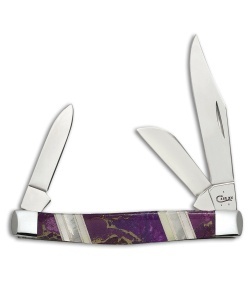 Part of the Exotic Stone Series, the Case Exotic King's Mine Medium Stockman Purple Turquoise scaled pocket knife is sure to be a favorite in any collection. Recognized as the color of royalty, vibrant purple handles of turquoise veined with gold make each knife one of a kind. Mother of Pearl, brass and nickel accents the King's Mine purple turquoise. Tru-Sharp surgical stainless steel blades with polished nickel silver bolsters ensures years of enjoyment. Expertly crafted and presented in a velvet keepsake box, the King's Mine Purple Turquoise knife will be a jewel your collection.